Pre Draft Report: Perci Garner was originally drawn to Ball State University as a football player after a senior season that saw him named the Eastern Central Ohio League Player of the Year (4,400 yards passing / 43 TDs, 700 yards rushing / 17 TDs). His high school athletic career saw him win two letters in basketball, three in football, and four in baseball. He went to Ball State planning on being its QB, but was redshirted in 2007 and didn’t see any game action as the third-stringer in 2008. He switched to baseball for the 2009 season (as a redshirt freshman) and appeared out of the ‘pen in 17 games. He switched to the rotation for 2010 (primarily as a Friday starter) and ended up an All-MAC selection. 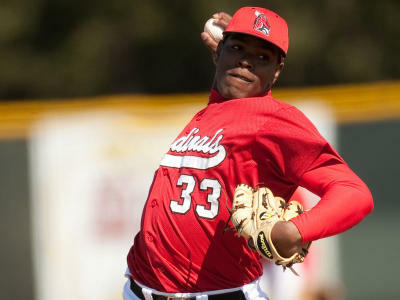 While there was some draft talk about him going into the year, an early season appearance against nationally-ranked Louisville when he struck out 6 in 4 innings and topped out at 96 mph really established him on the scouts’ radar. Ball State produced a first-round pick (Bryan Bullington, No. 1 overall) and sandwich-rounder (Luke Hagerty) in the 2002 draft, and could repeat the feat again this year with Kolbrin Vitek and Garner. Garner joined the Cardinals on a football scholarship, but didn’t see any game action in two years as a quarterback. After he emerged as the best pitching prospect in the Great Lakes League last summer, he gave up football, and he has continued to make strides this spring. Garner opened the season in Ball State’s bullpen but moved into the rotation after shutting down a talented Louisville lineup for four innings in mid-March. He has a strong, athletic 6-foot-2, 225-pound frame and a pair of plus pitches in a lively 92-94 mph fastball that reaches 97 and a power curveball. He also throws a slider and a changeup. Garner’s inexperience on the mound shows at times. His delivery can get slow and lack rhythm, and improving it would help his control. Though he’s a draft-eligible sophomore, he’s not considered a difficult sign. Perci Garner is a power-armed right-handed starting pitcher from Ball State University. Garner originally attended Dover High School in Dover, Ohio, a small town about 25 miles south of Canton, home to the football hall of fame. He was actually recruited more as a football player than a baseball player, though he ended up not getting any playing time over two years as a quarterback for the Ball State football team. He redshirted his entire 2008 season away as a result of playing football, but he gave up football entering the 2009 season, and even though he was understandably raw, he showed incredible potential. That potential has really shown itself this spring, as he’s installed himself as a starter over the last half of the year, and he’s showing true number two starter potential. His fastball is an easy plus pitch, sitting 92-94, touching 96, and his curveball also rates out as a potential plus pitch, giving him two plus pitches to work with before even getting in to any of his other pitches. His slider is a potential average pitch, as well, and when you add in a fringe-average changeup, he makes for a solid prospect package. His command is still lacking, and that’s his biggest weakness right now, but scouts are all drooling over getting him into their system. He could go as high as the supplemental first round, and he won’t get out of the third round, as he should be signable, even as an eligible sophomore. Garner did indeed sign quickly and was assigned to Williamsport. Career Synopsis: Garner’s career synopsis to this point is limited to two starts and four innings at Williamsport last year. Garner made those two starts during the first two weeks of the NYPL season, and then was shut down due to discomfort in his pitching arm. In late-July, he was sent to the GCL for a rehab stint with no expectation that he would return to Williamsport. Tests showed no structural damage, but given his inexperience, it appears that the Phils erred on the side of caution. Garner ultimately never made a start for the GCL Phils and was shut down for the season. For what it’s worth, Garner pitched 94 innings over his college career, allowing 94 hits, 53 walks, and striking out 107. John Sickels ranked Garner as the 15th best prospect in the Phillies’ system heading into 2011. Garner was again limited in 2011. He made four relief appearances for Williamsport before making his first start in mid-August. He’d make three more before the end of the year, throwing a total of 30 innings, allowing 29 hits and 9 walks while striking out 30. He didn’t allow a home run and threw 2.11 groundballs for every flyball. Heading into 2012, Garner sits at #13 on John Sickels’ list of Phillies prospects. Upside: Garner seems to be the pitching equivalent of the slew of toolsy outfielders the Phillies have drafted over the past few years. Having come from a mid-level program in the Midwest with the two year break to play football, he’s clearly raw and will require patience as he moves through the system. Just as clearly, he’s an elite athlete who throws very hard and has a breaking ball that already rates as above average, along with a change. The Phillies have handled him with kid gloves up to this point, but it seems likely that he will spend the majority of 2012 in a full season league finally. UPDATE: Garner never really found his command. He started 2013 in Clearwater and was double-jumped to LHV in August only to be dropped back to Reading. He started 2014 in Reading but finished the season in Clearwatrer. Garner was released 3/29/2015. He caught on with the Cleveland Indians organization in July and pitched for the Lynchburg Hillcats in the Carolina League (A+). Few prospects looked as impressive for Williamsport last season than Perci Garner. The strong 6’3 225 pound former Ball State quarterback has a fantastic arm and should rise quickly through the Phillies system. The main issue for Garner is command. He features a great fastball that sits 92-93, touches 94-95 and has even hit 97 at times, according to a few radar guns. His curveball is also a plus pitch and should be an integral part of his arsenal going forward. Updated 1/3/12 with 2011 recap and outlook.